Katarzyna believes that many challenges and difficulties that people meet in their lives both professional and private, can be solved by knowing what the “big picture” while also improving their communication skills. Helping people discover the bigger picture for themselves is what she concentrates on in her work. The biggest reward from her work is the spark in the eyes of the people she works with when they find their own power to move things forward. Her skills and abilities that are valued by her clients are her willingness to listen, tolerance and flexibility, non-judgemental approach to people, ability to arrange and systematize, good observation skills and her “Yes you can” attitude – both for others and for herself. She has 11 years or approximately 8,000 hours of experience in design and delivery of training programs and projects that also include management and evaluation of training projects She conducts development programs related to Management, Teambuilding, Leadership, Creative Problem Solving, Age Diversity Management and Presentation Skills in Polish and English. She facilitates strategic workshops and team-coaching sessions. 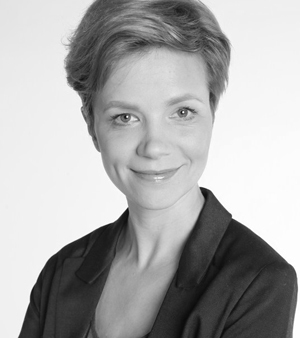 Katarzyna holds a PCC (Professional Certified Coach) certification from the ICF (International Coach Federation) with experience of over 1,000 coaching hours delivered for managers and specialists in numerous companies. Her previous professional experience covers careers in customer service, sales and market research for multinational companies. As a teenager, Katarzyna emigrated to Canada, where she lived for more than two years, which gave her multicultural sensitivity and an almost-native level of English. She holds an MA in Psychology from the Jagiellonian University. She also attended post-graduate studies in Market Research and CSR. Her education includes numerous courses related to training and coaching, such as Trainers’ and Consultants’ Association “MATRiK” course for trainers, course in interpersonal trainings, an advanced program of ROZVIYAK – Lesser Poland School for Organisation Trainers, Erickson College’s “Art and Science of Coaching” and “Team Coaching”, House of Skills’ workshops for advanced trainers, and a course in psychodynamic coaching by Halina Brunning. Apart from having lived in Canada, she has travelled to numerous countries and also speaks – French and communicative German and Russian. She likes an active lifestyle and cooking. She is based in Kraków, Poland. Abile, Aperam, Arcelor Mittal, Bahlsen, Billa, BP, Bridgestone, Consultronix, Electrolux, Energia Pro, Heban, Intergraph, Intersnack, International Paper, Kompania Piwowarska, Linklaters, Mercedes Benz, Ministry of Justice, Ministry of Labour and Social Policy, Manex, Multimedia SA, NC+, Pandora, Profill, RR Donneley, State Street, Transporeon, Tauron, TRW, Viessmann, Whirlpool, and numerous state institutions throughout Poland.